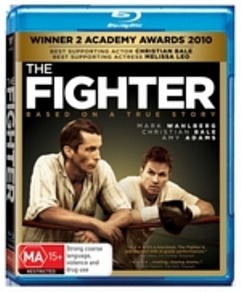 The Fighter is based on the true story of boxing legend, Micky "Irish" Ward, played by Mark Wahlberg who was forced to reside in the shadow of his brother Dicky Eklund (Christian Bale). Dicky's claim to fame was that in 1978, he knocked out Sugar Ray Leonard but unfortunately he became involved with the wrong people that lead him to drug addiction. However even with his addiction, he continues to "train" his brother who has been called as a stepping stone for other boxes. His mother Alice (Melissa Leo) is Micky's manager and as she sees Dicky through rose coloured glasses, this hampers her decisions to choose the right fights for her son. To compound the situation, HBO are filming a documentary on Dicky that he believes is about his boxing comeback but in actual fact, it is about crack addiction. Eventually Micky and his new girlfriend Charlene (Amy Adams) come to the conclusion that his family is hampering his career which forces a rift between his mother and brother. This is quite a powerful scene as Micky chooses love over his family and thankfully his father is still in his corner... pun intended for support. Dicky is also arrested and without the influence of mother and brother, Micky finally starts to make inroads to the World Championship thanks to new trainer Mickey O'Keefe played by none other than Mickey O'Keefe. Director David O.Russell also does a remarkable job at creating a unique insight into this working class family with some exceptional acting by all involved, especially Bale who once again goes above and beyond his usual method acting. Melissa Leo is also amazing as the patriarch of the family that believes her eldest son, Dicky can do no wrong. It takes his imprisonment to realise that Dicky is not the angel that she believed him to be. Wahlberg is great as a troubled yet focused man and seeing him evolve into a World Champion boxer is a true treat. Even with all this drama in the film, it is also the story of friendship and the camaraderie between brothers and the romance between Micky and Charlene. All in all, the entire cast done a remarkable job at recreating the true life of Micky Ward. On Blu-ray, the video quality is outstanding with sharp images, vibrant colours and exceptional video quality from start to finish. Audio is equally good, even though there are no real standout moments in the movie, except the world championship fight at the end. There's some interesting special features on this release from an informative commentary with the director, mini-featurettes and the deleted scenes. In the end, The Fighter is a brilliant drama that really tugs at your emotions and delivers a grade-A story.